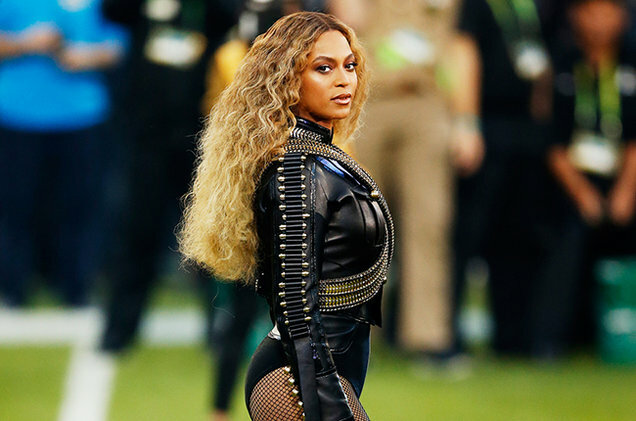 Beyoncé at the Super Bowl. Via @beyonce on Instagram. It’s not that I was ever a Beyoncé hater. It’s just that I hold a grudge. And for a long time, I couldn’t forgive Bey for what is arguably one of her shadiest and savviest moves as an artist: ditching Destiny’s Child. I’m not talking about the second, slimmed down edition of Destiny’s Child either, with Kelly Rowland and Michelle Williams. I’m talking “Bills, Bills, Bills” and LeToya Luckett and LaTavia Roberson finding out they’d been replaced when the video for “Say My Name” was released—and they weren’t in it! That I couldn’t forgive. I know it’s business, but still. So for years, I’ve kept my distance from all the Beyoncé love. I did listen to her music a bit (who could resist turning up to “Survivor” or “Single Ladies (Put a Ring on It)”?) but I wasn’t buying albums or concert tickets and was keeping my own little vigil for LeToya and LaTavia. Then in the last two years, something happened that brought me over to the BeyHive. My own growth as a woman correlated with Beyoncé’s evolution from pop star to multitalented artist. Which is how I found myself signing up for TIDAL Premium at 2 a.m. and watching Serena Williams descend those stairs like the goddess she is. On her 2013 self-titled album, Beyoncé started to say some things that all women know and other things that only black women know. 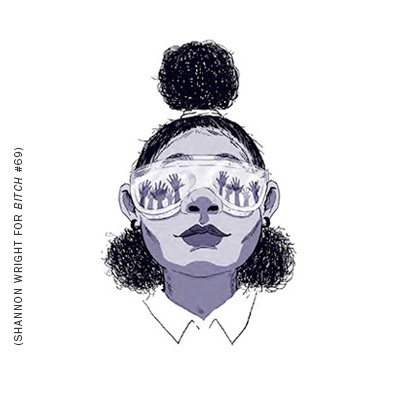 When she sampled my literary sister Chimamanda Ngozi Adichie on “Flawless,” I grew in stature and sauntered down sidewalks with the understanding that I was feminist and beautifully, impossibly strong, even though the world had aspirations for me that did not match my dreams. 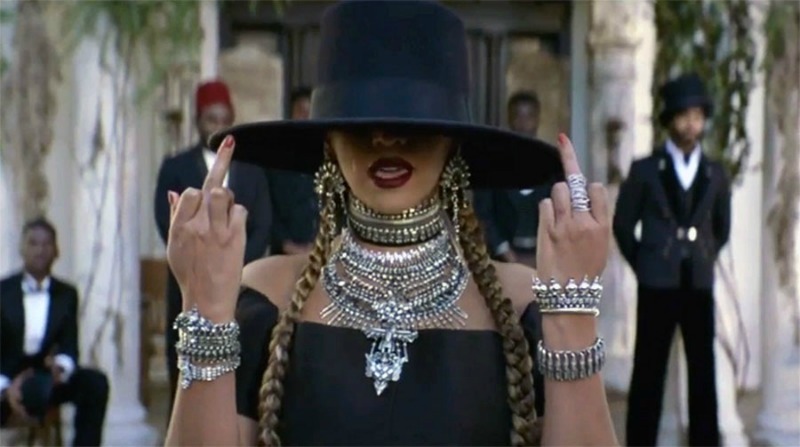 By the time “Formation” landed on my screen and I spent a Saturday afternoon in stunned awe, I was standing alongside Beyoncé with a raised fist, exhaling at the weight of the chains on my feet and the noose around my neck in the only city that has ever felt like a second home, New Orleans. I wanted more. So after years of boycotting the Super Bowl and professional sports in general, I found myself in a too-crowded bar on Super Bowl Sunday awaiting greatness. Beyoncé had something to say as her dancers strutted out in an ode to the Black Panthers. That thing catching in her throat was slowly being breathed out. Like many people, I felt conflicted by this new love I had developed for Beyoncé. Her brand of feminism doesn’t quite call for the revolution I need, her lyrics can be troubling at times, and she is the finely tailored product of a capitalistic system that exploits and undervalues the very people she wants to uplift. I’m not sure how to process a critique of Lemonade from a woman who has wrapped her significant arms around Emma Watson…the face of He For She (a very glib UN campaign for gender equality) while expecting Beyoncé to deliver a flawless feminist work lest she be written off as nothing more than a pretty princess of capitalism. Sure, Beyoncé isn’t perfect, but hooks’s response felt like a betrayal at a time when Beyonce was already receiving negative publicity for celebrating Black bodies and telling a Black woman’s story. Et tu, hooks? Even though Beyoncé and her creative collaborators make use of the powerful voice and words of Malcolm X to emphasize the lack of respect for black womanhood, simply showcasing beautiful black bodies does not create a just culture of optimal well being where black females can become fully self-actualized and be truly respected. For hooks, Lemonade is simply “fantasy feminism.” Yes, it’s fun to see Beyoncé swing a bat with pure delight in a stunning dress, but then what? Even the highest paid pop star in the world is still Black, and a woman. As am I. Beyoncé’s Lemonade is the telling of my story and the stories of the Black women in my life. So on Monday night, I did a thing I swore I never would. I bought an overpriced ticket to a giant stadium, got dressed up to stand in the rain, and finally witnessed Beyoncé’s magic firsthand at the Minneapolis stop of the Formation World Tour. First of all, anyone who can bring that much positive energy together under one roof is worth their weight in gold—there was a sense of camaraderie, even through the temporary evacuation of the stadium because of thunderstorms. All 35,000 of us had bought tickets to a shared adventure, and we couldn’t wait to get there—together. 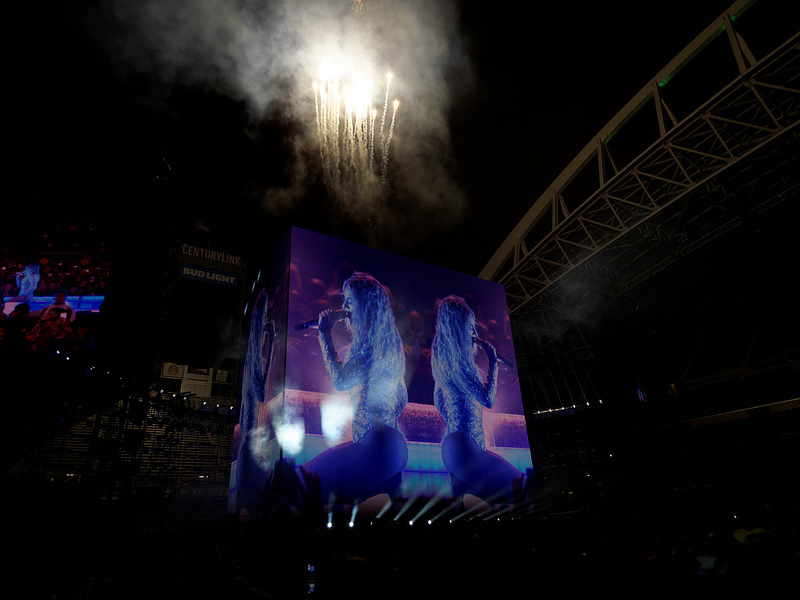 Beyoncé’s performance was pure sorcery: pools were conjured on stage, flames spewed into the sky, aerial artists swung from the sky, and fireworks went off in the night air. Her set included a seven-story cube that projected images and videos in between sets, and a gang of unseen wind machines that kept her hair blowing seductively from start to finish. Seriously. Not for one second did Beyonce’s hair cease to blow in the wind. She delivered big for both her old and new fans, cycling through Lemonade but also reaching back to her earlier days with songs like “Survivor” and “Irreplaceable.” Then, in a city still mourning one of its greatest, Beyoncé flooded the stadium with purple light and covered Prince’s “The Beautiful Ones.” There were tears in my eyes as she cradled a guitar on stage and tore into a moving rendition of the song. By the time Beyoncé got to “Diva” and had the largely female audience chanting, “diva is a female version of a hustler/ of a hustler, of a, of a hustler” I was ready to join up and pay my dues. My name is Kari and I am part of the BeyHive. The histories of wage disparities for women of color are different than those of white women, and these histories impact the stories we tell about equal pay and the solutions we generate.